Tsushima is a Japanese island in the Korea Strait halfway between Kyūshū and South Korea. The island is about 130 km (80 mi) long and 15-20 km (9-13 mi) wide, hilly or mountainous in most areas. The island is sparsely populated with a permanent population of a little over 40,000. Most of the island is included in the Iki-Tsushima Quasi-National Park. The island is accessible by high-speed ferries from Fukuoka and Iki Shima, Kyūshū, and also from Busan, Korea. There is also air service from Fukuoka and Nagasaki. For administration Tsushima is organized as a city within Nagasaki Prefecture. Tsushima is nearly cut into two by a deep fjord-like inlet called Asō Bay, and a canal has been built to complete the separation. The northern (and larger) section is called Kamino Shima, and the southern portion is Shimono Shima. In Japanese, the word for a lighthouse is tōdai or toudai (灯台). The words saki and misaki are for capes and headlands, shima (also spelled sima or jima) is an island, wan is a bay, and kō is a harbor. 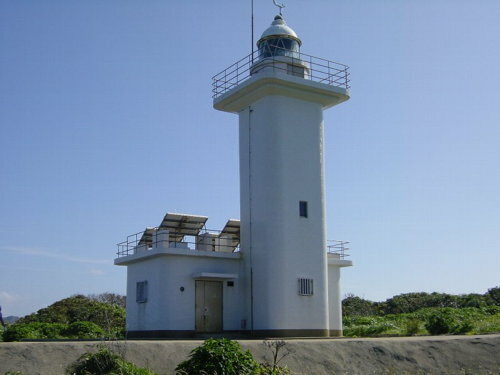 Lighthouses in Japan are operated and maintained by the Japanese Coast Guard's Maritime Safety Agency. There is at least one Coast Guard Section Office in each prefecture, often two or more. Tsushima has its own Coast Guard office located at Izuhara. ARLHS numbers are from the ARLHS World List of Lights. JCG numbers are the Japanese Coast Guard's light list numbers. Admiralty numbers are from volume M of the Admiralty List of Lights & Fog Signals. U.S. NGA List numbers are from Publication 112. A comprehensive site, almost entirely in Japanese. An index to a large collection of photos; the lights are identified by the JCG number. Photos and information about all the major lights of the island. 1964. Active; focal plane 23 m (75 ft); white light, 4 s on, 4 s off; also a continuous white spotlight (JCG-6029) illuminates a reef 300 m (330 yd) to the east. 9.5 m (31 ft) round concrete tower attached to a 1-story concrete equipment room. Entire lighthouse is white. A good closeup is available, the Coast Guard has another closeup, Kiso has distant views from the sea (1/4 the way down the page), and Google has a satellite view. Located on the northeastern tip of a peninsula (connected to the mainland by a very narrow isthmus) at the extreme northeast corner of Tsushima. Site open but difficult to reach, tower closed. ARLHS JPN-588; JCG-6028; Admiralty M5065; NGA 12492. 1977. Active; focal plane 11 m (36 ft); red flash every 3 s. 9.5 m (31 ft) concrete post attached to a square 1-story concrete equipment room. Entire lighthouse is red. Yoshihisa Koga has an aerial view, Google has a satellite view and a very distant street view across the harbor. Located at the tip of a headland on the north side of the entrance to the harbor of Kamitsushima, near the northeast corner of Tsushima. Probably accessible only by boat. Site open, tower closed. ARLHS JPN-2185; JCG-6027; Admiralty M5062; NGA 12500. 1946. Active; focal plane 26 m (85 ft); white flash every 3 s. 9 m (30 ft) concrete post centered on a square 1-story concrete equipment room. Entire lighthouse is white. The Coast Guard has additional photos, Kiso has a photo (1/4 the way down the page), and Google has a satellite view. Located on a promontory on the south side of the entrance to the harbor of Kamitsushima. Accessible only by boat or by a long hike. Site open, tower closed. ARLHS JPN-771; JCG-6024; NGA 12496. 1995. Active; focal plane 8 m (26 ft); three white flashes every 10 s. 7 m (23 ft) round bottle-shaped concrete tower mounted on a round concrete pier. Lighthouse painted black with one yellow horizontal band. A Coast Guard photo is at right, the Coast Guard has an additional distant view, and Google has a satellite view. Located on an island off the entrance to Kamitsushimacho Goneo, a small fishing harbor south of Kamitsushima. Accessible only by boat. Site open, tower closed. JCG-6023.3; Admiralty M5057.6. 1960. 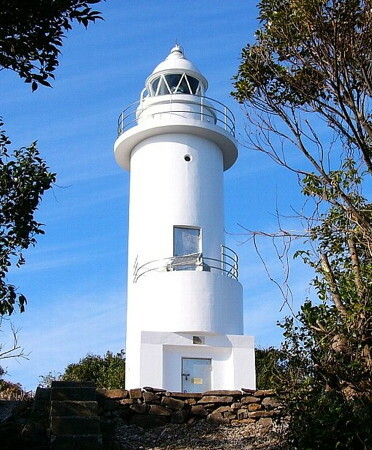 Active; focal plane 77 m (252 ft); white flash every 10 s. 7.5 m (25 ft) square cylindrical concrete tower with round lantern room and gallery, centered on a square 1-story concrete keeper's cottage. Entire lighthouse is white (it appears to covered with white tiles). The Coast Guard has the photo at right as well as a panoramic view, a closeup photo is available, and Google has a satellite view. Located on a promontory at the northern entrance to the harbor of Kin Wan (Kin Bay) on the northeastern coast of Kamino Shima. Probably accessible by a short hike but local guidance may be needed. Site open, tower closed. ARLHS JPN-258; JCG-6023; Admiralty M5057; NGA 12512. 1965. Active; focal plane 14 m (46 ft); continuous red light with a more intense flash every 3 s. 10 m (33 ft) concrete post attached to a square 1-story concrete equipment room. Entire lighthouse is red. Google has an indistinct satellite view. Located at the end of the east (really north) breakwater of Saga. Accessible by walking the pier. Site open, tower closed. JCG-6018; Admiralty M5056.6; NGA 12528. 1964. Active; focal plane 48 m (157 ft); white flash every 4 s; also a continuous white spotlight (JCG-6016) illuminates a nearby reef. 10 m (33 ft) concrete post attached to a 1-story equipment building. Entire lighthouse is white. The Coast Guard has a closeup photo and Google has a satellite view. Located at the end of a knife-edged ridge about 5 km (3 mi) southeast of Saga. Site status unknown; it would be difficult to reach this location. ARLHS JPN-702; JCG-6015; Admiralty M5056.4; NGA 12532. 1951. Active; focal plane 144 m (472 ft); white flash every 3 s. 13 m (43 ft) 2-stage round cylindrical concrete tower with lantern and gallery. Entire lighthouse is white. The Coast Guard has the closeup photo appearing at the top of this page and Google has a satellite view. 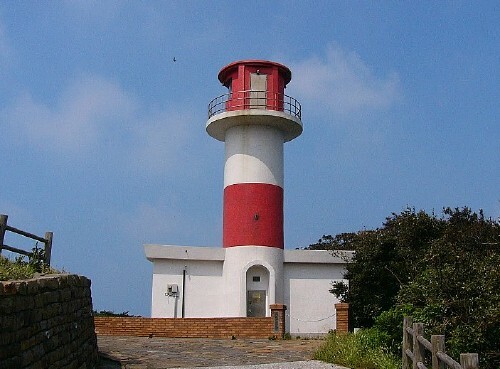 Located at the eastern tip of an island about 2.5 km (1.5 mi) northeast of the Orise Hana lighthouse (next entry), which seems to have replaced this lighthouse as the primary landfall light for Tsushima. Accessible only by boat, and there's no mooring available. Site status unknown. ARLHS JPN-2212; JCG-6011; Admiralty M5052; NGA 12544. 1978. Active; focal plane 115 m (377 ft); white light, 4 s on, 4 s off. 8.5 m (28 ft) round cylindrical concrete tower with gallery. Entire lighthouse is white. Google has a satellite view. 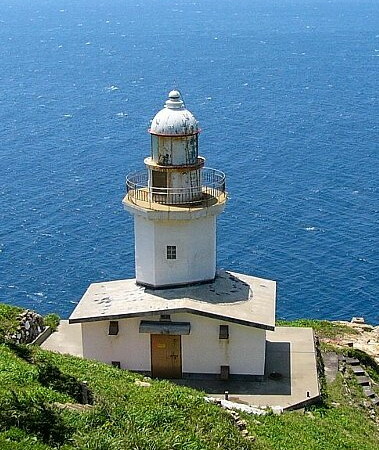 This is a landfall light for vessels arriving in Tsushima from the main islands of Japan. Located high on a bluff near the northeastern tip of Shimono Shima. Access would require a substantial hike. Site status unknown. ARLHS JPN-493; JCG-6010; Admiralty M5052.5; NGA 12540. 1991. Active; focal plane 11 m (36 ft); green flash every 3 s. 9 m (30 ft) round concrete tower with flared top, attached to a small 1-story equipment shelter. Entire lighthouse is white. Google has a satellite view and a very distant street view. This light marks the east entrance to the Asō Bay Canal. Located at the east end of the detached outer breakwater at Ohunakoshi. Accessible only by boat. Site open, tower closed. JCG-6009.2; Admiralty M5051; NGA 12556. 1978. Active; focal plane unknown; continuous white light. Approx. 16 m (52 ft) round hourglass-shaped white concrete tower. Google has a satellite view. The light illuminates Kuzira Se, a reef 880 m (1/2 mi) northeast. Located on a steep slope northeast of Izuhara harbor. Accessible by road, but some local guidance may be needed. Parking is provided at an overlook below the lighthouse. Site open, tower closed. JCG-6008; Admiralty M5048.7. Date unknown (station established 1924). Active; focal plane 45 m (148 ft); white light occulting once every 8 s. 8 m (26 ft) square cylindrical concrete tower attached to a small concrete equipment shelter. Entire lighthouse is white. Google has a satellite view. Located on a promontory sheltering the north side of the entrance to Izuhara (Iduhara) harbor. Probably accessible by a short hike. Site open, tower closed. JCG-6004; Admiralty M5047; NGA 12564. 1999. Active; focal plane 13 m (43 ft); red light, 2 s on, 2 s off. 9.5 m (31 ft) round concrete tower with flared top, attached to a small 1-story equipment shelter. Entire lighthouse is red. Google has a satellite view and a distant street view. Located on the detached breakwater at Iduhara, a small port midway on the east coast of Shimono Shima. Accessible only by boat. Site open, tower closed. JCG-6006; Admiralty M5050. 1971. Active; focal plane 13 m (43 ft); two red flashes every 6 s. 9.5 m (31 ft) concrete post rising from a square 1-story concrete equipment room. Entire lighthouse is red. Google has a street view and a satellite view. Located on the east inner breakwater at Iduhara. Accessible by walking the pier. Site open, tower closed. JCG-6005; Admiralty M5048.5; NGA 12568. Date unknown (station established 1894). Active; focal plane 61 m (200 ft); white flash every 15 s. 11 m (36 ft) octagonal cylindrical concrete tower with lantern and gallery, rising from the seaward side of a 1-story concrete keeper's house. Entire lighthouse is white. The Coast Guard has the photo at right, Kiso has a photo (1/4 the way down the page), and Google has a satellite view. 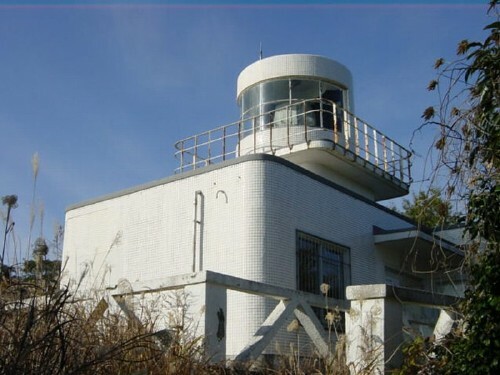 This is Tsushima's oldest light station, but we need information on the history of the present lighthouse; it does not appear to be of 19th century origin. Located on a steep promontory at the southeastern tip of Tsushima; the location is quite remote. Site status unknown. ARLHS JPN-267; JCG- 6003; Admiralty M5042; NGA 12580. 1994. Active; focal plane 14 m (46 ft); green light, 3 s on, 3 s off. 11 m (36 ft) concrete post attached to a 1-story equipment building. Entire lighthouse is white. Google has a street view and a satellite view. 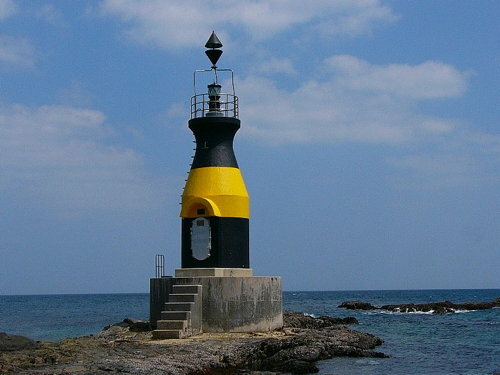 Located at the end of the outer breakwater at Azamo, a harbor sheltered by Kan Saki. Probably accessible by walking the pier, and the light is easily seen from shore. Site open, tower closed. ARLHS JPN-2287; JCG- 6002.5; Admiralty M5040; NGA 12582. 1987 (station established 1909). Active; focal plane 106 m (348 ft); white flash every 10 s; also a continuous white spotlight (JCG-6001.01) illuminates the Kanesiro Iwa lighthouse (next entry). 19.5 m (64 ft) round cylindrical concrete tower with lantern and gallery, rising from a 1-story equipment building. Entire lighthouse is white. A Coast Guard photo is at right, Kiso has excellent photos (1/4 the way down the page), a good closeup and a second closeup are available, and Google has a street view and a satellite view. The Japanese caption below the last photos reads, "Note the top of the promontory with the Tsutsu Saki lighthouse, forward is the old lighthouse." Located at the southwestern tip of Tsushima. Accessible by road and a short hike; parking provided. Site open, tower closed. ARLHS JPN-704; JCG-6001; Admiralty M5038; NGA 12588. 1909. Inactive since 1987. 22 m (72 ft) round stone tower with a small lantern and gallery. Entire lighthouse painted white. The Coast Guard's photo is below right, Ryohsuke Torii has a more distant photo, Makio Matsuda has the view from the Tsutsu Saki lighthouse, Kiso also has a good view from the sea (1/4 the way down the page), and Google has a satellite view. 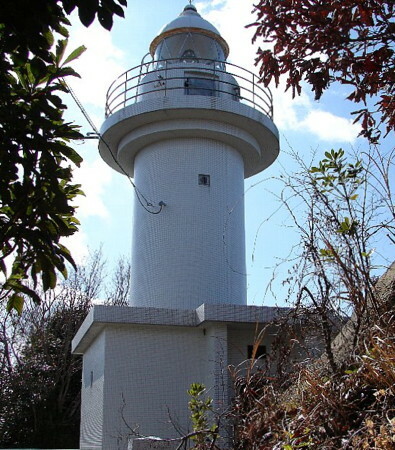 This historic lighthouse, the second oldest lighthouse in Tsushima, was the only light at Tsutsu Saki until 1987. Since that time it has been spotlighted at night from the new lighthouse (previous entry). The surrounding waters are notoriously dangerous due to strong tidal currents around the end of the island. Located on a dangerous reef off the tip of Tsutsu Saki. Accessible only by boat. Site open, tower closed. ex-Admiralty M5038. 1988. Active; focal plane 14 m (46 ft); green flash every 3 s. 9 m (30 ft) round concrete tower with flared top and gallery, attached to a small 1-story equipment shelter. Entire lighthouse is white. Google has a street view and a satellite view. Listed by NGA as "Tutu Saki Northward." Located on the north breakwater at Kunehama, about 8 km (5 mi) north of Tsutsu Saki. Accessible only by boat. Site open, tower closed. ARLHS JPN-2283; JCG-6048; Admiralty M5074.6; NGA 12590. 2008 (station establishment date unknown). Active; focal plane 13 m (43 ft); continuous red light with a more intense flash every 6 s. 10 m (33 ft) round concrete tower with flared top and gallery, attached to a small 1-story equipment shelter. Entire lighthouse is red. Google has a satellite view and a very distant street view. Located on the detached breakwater at Komoda, a small port midway on the west coast of Shimono Shima. Accessible only by boat. Site open, tower closed. ARLHS JPN-2208; JCG-6046; Admiralty M5074; NGA 12596. 1960. Active; focal plane 27 m (89 ft); white light, 3 s on, 3 s off. 8.5 m (28 ft) round concrete tower centered on on a square 1-story concrete equipment room. Entire lighthouse is white. A closeup is available, the Coast Guard has additional photos, Kiso has two photos (1/4 the way down the page), and Google has a satellite view. Located on a promontory on the south side of the entrance to Asō Bay; access would require a substantial hike. Site open, tower closed. ARLHS JPN-070; JCG-6045; Admiralty M5072; NGA 12608. Note: Asō Bay separates the two "halves" of Tsushima, Kamino Shima and Shimono Shima. The eastern end of the bay divides into two branches. The Asō Strait Canal, a cut about 600 m (0.4 mi) long, connects the end of the southern branch to Miura Bay on the east side of Tsushima, completing the separation of the island. 1977. Active; focal plane 13 m (43 ft); white flash every 3 s. 10 m (33 ft) round concrete tower attached to a small 1-story equipment room. Entire lighthouse is white. Kiso has a photo (1/4 the way down the page) and Google has a satellite view. Located at the tip of a long peninsula projecting into the south side of Asō Bay. Accessible only by boat. Site open, tower closed. ARLHS JPN-2188; JCG 6044; Admiralty M5073.2; NGA 12612. 1966. Active; focal plane 14 m (46 ft); white flash every 4 s. 13 m (43 ft) round concrete tower, attached to a small concrete equipment room. Entire lighthouse is white. Google has a satellite view. Located at the northern tip of an island in the southern branch of Asō Bay. Accessible only by boat. Site open, tower closed. ARLHS JPN-2224; JCG-6041; Admiralty M5073.4; NGA 12616. 1980. Active; focal plane about 14 m (46 ft); white flash every 3 s. Approx. 12 m (39 ft) round cylindrical concrete tower with gallery. Entire lighthouse is white. Google has a satellite view. Located on a reef just off a promontory on the north side of the southern branch of Asō Bay, about 800 m (1/2 mi) northwest of the entrance to the Asō Strait Canal. Accessible by a hiking trail in Asō Bay Park; parking is available near the trailhead. Site open, tower closed. JCG-6043; Admiralty M5073.8. 1951. Active; focal plane 29 m (85 ft); white flash every 5 s. 12 m (39 ft) round cylindrical concrete tower with gallery. Entire lighthouse is white. Google has a satellite view. Listed by NGA as Kuromi Saki. Located on a promontory on the north side of the southern branch of Asō Bay. Site status unknown. ARLHS JPN-2213; JCG-6042; Admiralty M5073.7; NGA 12620. 1985. Active; focal plane 12 m (39 ft); green flash every 3 s. 9.5 m (31 ft) round concrete tower attached to a small 1-story equipment room. Entire lighthouse is white. Google has a satellite view and a distant street view. This is the light listed by NGA as "Asō Wan Mizus-aki Zyoko." Located at the end of the main breakwater of Mizusaki, a fishing port on the north side of Asō Bay. Accessible by walking the pier. Site open, tower closed. ARLHS JPN-2163; JCG-6040.5; Admiralty M5073; NGA 12604. 1965. Active; focal plane 12 m (39 ft); white flash every 3 s. 10 m (33 ft) round concrete tower attached to a small 1-story equipment room. Entire lighthouse is white. Google has a satellite view. Located at the tip of a sharp promontory on the north side of the entrance to a fjord about 16 km (10 mi) north of Asō Bay. Accessible only by boat. Site open, tower closed. ARLHS JPN-2226; JCG-6039; Admiralty M5071; NGA 12600. 1986. Active; focal plane 13 m (43 ft); red flash every 4 s. 10 m (33 ft) round concrete tower attached to a small 1-story equipment room. Entire lighthouse is red. Google has a street view and a satellite view. Located at the north end of the detached breakwater at Unatsura. Accessible only by boat, but easily seen from shore. Site open, tower closed. ARLHS JPN-2285; JCG-6038.5; Admiralty M5070.5; NGA 12468. 1976. Active; focal plane unknown; continuous white spotlight. Approx. 20 m (66 ft) round cylindrical white concrete tower. Google has a satellite view. The light illuminates a round stone daybeacon on the Myo Se reef 650 m (0.4 mi) north. Google also has a satellite view of the reef. Located atop a sharp promontory at the entrance to Kishikata Bay. Site status unknown; access would require a substantial hike. JCG-6038; Admiralty M5070.4; NGA 12464. 1981. Active; focal plane 11 m (36 ft); continuous green light with a more intense flash every 3 s. 9.5 m (31 ft) concrete post rising from a square 1-story concrete equipment room. Entire lighthouse is white. Google has a street view and a satellite view. Located on the west breakwater at Ina, a port sheltered by Kamiagata Saki. Accessible by walking the pier. Site open, tower closed. ARLHS JPN-2189; JCG-6036; Admiralty M5070.2; NGA 12460. 1962. Active; focal plane 135 m (443 ft); white light occulting three times every 16 s. 12 m (39 ft) round cylindrical concrete tower with lantern and gallery, attached to a 1-story keeper's house. Fresnel lens in use. Entire lighthouse is white. The Coast Guard has the photo above right and a second photo, a fine closeup is available, and Google has a satellite view. Located on a prominent cape on the central west coast of Kamino Shima. Accessible by a short hile, but local guidance may be needed. Site open, tower closed. ARLHS JPN-216; JCG-6035; Admiralty M5070; NGA 12456. 1967. Active; focal plane 84 m (276 ft); white flash every 5 s. 11 m (36 ft) round cylindrical concrete tower with lantern and gallery, attached to a 1-story equipment room. Lighthouse painted with red and white horizontal bands. One of the Coast Guard's photos is at right, an excellent closeup and a 2018 closeup are available, and Google has a satellite view. 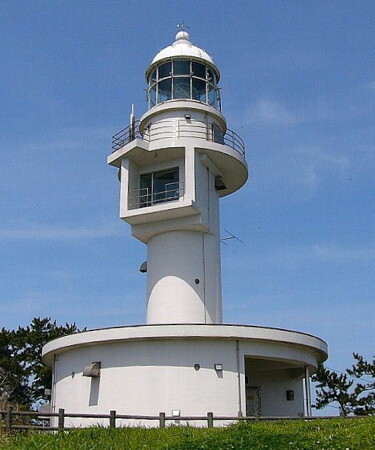 This lighthouse is at the north end of Saozaki Park, a popular public garden; in good weather the Korean coast is visible across the Korea Strait. Located on a steep promontory at the northwestern corner of Tsushima. Accessible by road. Site open, tower closed. ARLHS JPN-703; JCG-6034; Admiralty M5069.4; NGA 12472. 1966. Active; focal plane 11 m (36 ft); continuous white light with a more intense flash every 6 s. 9.5 m (31 ft) concrete post centered on a round 1-story concrete equipment room. Entire lighthouse is white. Google has a satellite view. Located on a rocky ledge on the north side of the entrance to Sasuna harbor, about 5.5 km (3.5 mi) east of Sao Saki. Easily seen from the coastal road leading northwest from Sasuna. Site open, tower closed. ARLHS JPN-2260; JCG-6033; Admiralty M5069; NGA 12476. 1950 (station established 1894). Active; focal plane 23 m (75 ft); white flash every 15 s. 14 m (46 ft) round cylindrical concrete tower with lantern and gallery, rising from a square 1-story keeper's house. Entire lighthouse is white. The Coast Guard has the closeup photo at right and a distant view, and Google has a satellite view. The original lighthouse was destroyed by U.S. bombing in 1945. Located on a small island about 1.5 km (1 mi) off the northernmost tip of Tsushima. Accessible only by boat. Site status unknown. ARLHS JPN-364; JCG-6031; Admiralty M5068; NGA 12484. 1977. Active; focal plane 21 m (69 ft); white flash every 4 s, 10 m (33 ft) round white concrete tower with gallery. Google has a satellite view. Located on a skerry about 500 m (1600 ft) off the rugged north coast of Tsushima. Accessible only by boat in challenging seas. Site open, tower closed. JCG-6030; Admiralty M5067; NGA 12488. Posted August 6, 2007. Checked and revised December 26, 2018. Lighthouses: 35. Site copyright 2018 Russ Rowlett and the University of North Carolina at Chapel Hill.